Congratulations to our April Employees of the Month! Congratulations to Teresa Enriquez and Berta Tercero! Teresa Enriquez, will be celebrating her 5 year anniversary with the Cancer Center this April. Teresa started out working in the billing department for UNMH. While working in the billing department she studied to become a certified coder, and did so in 2011. Three years ago she joined the coding department, first coding for chemo services and now has expanded her knowledge to include Radiation Oncology and E/m services as a well. Teresa is a dedicated employee, and asset not to the coding department but to the Cancer Center as well. Thank you! 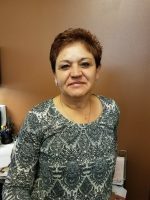 Berta Tercero, Account Operations Tech 3, has been with UNMCCC going on 5 years. She is efficient, detailed, and prepared in her process in resolving outstanding account balances in a timely manner and demonstrates a high quality of work. This is demonstrated in her productivity and in her professional manner. She has made several contacts with our Servicing Units for our IHS accounts, which also helps in the resolution of outstanding claims. She is a ray of sunshine to our department, as she is always smiling and very positive. Thank you!